Golden Goose: Totem Treasure Video Slot Review - Casino Answers! 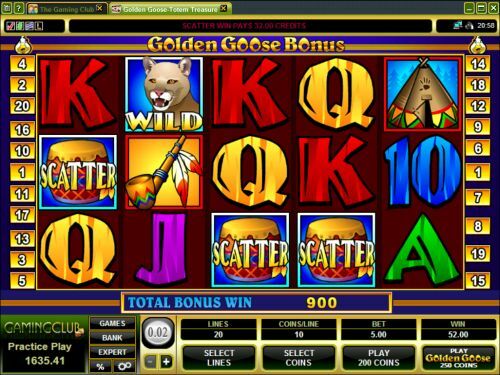 Golden Goose: Totem Treasure is a 5-reel, 20-line video slot developed by Microgaming, featuring a wild multiplier symbol, scatter wins, multipliers, sidebets, free spins and four bonus games. 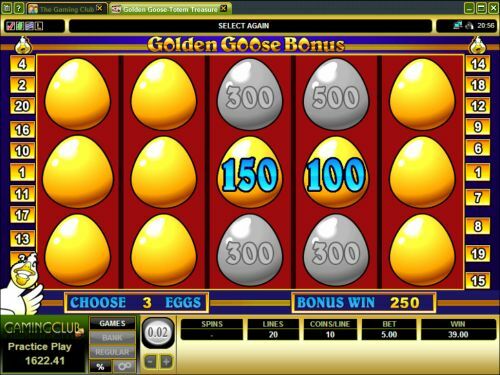 You can play the Golden Goose: Totem Treasure video slot at Bovada. Bets on the Totem Treasure slot machine are $0.02, $0.05, $0.10 and $0.20. You can select 1-20 lines per spin at 10 coins per line on the Totem Treasure video slot. The maximum total bet is $50 with the Golden Goose feature enabled ($40 with it turned off), which is a low betting range that is best suited for the more casual players. To play the Totem Treasure online slot, select your bet and press the “Spin” button. To enable the Golden Goose feature, press the “Play Golden Goose” button. Totem Treasure’s top-paying symbol is the Squaw symbol. If 5 Squaw symbols appear on a selected payline, you will win the 12,000 coin top jackpot. This is an exceptional top payout, which backs up the “treasure” part of the name. The Squaw symbol is a wild multiplier and will substitute for all other symbols on the Golden Goose: Totem Treasure video slot, except for the Scattered Drum symbol. When the Squaw wild symbol substitutes in a winning combination, your winnings will be doubled. The Squaw will change into a Cougar symbol when it appears in a winning combination. Other high paying symbols include the Tipi (2000 coins) and Campfire (1000 coins). The scatter symbol on the Golden Goose: Totem Treasure slot game is the Drum. You can get a scatter win of up to 400X your total bet by hitting three or more Scattered Drum symbols anywhere on the reels of Golden Goose: Totem Treasure. 400X is a huge scatter win that can be yours simply by playing at Bovada! Payouts are displayed on the Paytable. Only the highest win is paid per selected payline. All wins pay left to right and right to left. The Squaw symbol is wild and will substitute for all symbols except for the scatter symbol. Golden Goose: Totem Treasure has an autoplay feature with advanced settings. To use the autoplay mode on the Totem Treasure online slot machine, you must hit the “Expert” button. You can now play 5 or 10 autoplay spins. For advanced settings, hit the “AutoPlay” button and you can now play 5, 10, 25, 50, 100, 250 or 500 autoplay spins and stop autoplay if a win exceeds or equals $100, $500, $1000, $5000 or $9999. Autoplay will always play the Golden Goose sidebet. Autoplay will stop on any feature contained in the game. You can stop autoplay at any time on the Totem Treasure slot game. The Golden Goose feature really spices up what was once a featureless Totem Treasure video slot. We definitely recommend playing this version of the Totem Treasure slot game rather than the original 5-line video slot, although you can play that version as well at Bovada! Can USA players play the Totem Treasure slot game for real money? No, American players cannot play the Totem Treasure online slot for real money. Instead, we recommend that you read our Fire Hawk Video Slot Review. How do I get one of the Golden Goose special features? Make sure you are playing with the Golden Goose sidebet for all spins you make on the Golden Goose: Totem Treasure online slot. Then, simply keep spinning the reels until the Golden Goose feature is activated.